NOTE: When you think of a right or a left spring you should be in the garage and be looking at the header where your torsion tube is mounted. Your right sring will be left wound and your left spring will be right wound. Don't let this confuse you. Just think, is the spring I want to the right or the left of center? Then order accordingly. 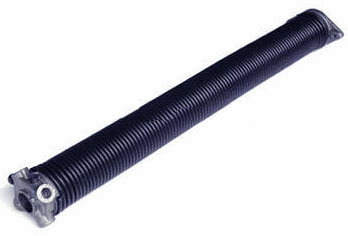 Springs are generally good for 10,000 cycles and are coated black steel. If your springs look old or rusty, change them before your car gets stuck in the garage! !INTERNET PRICE ONLY!! !